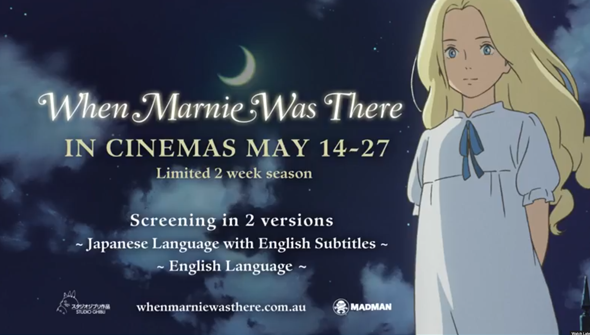 When Marnie Was There, Studio Ghibli's most recent feature is due to arrive in the US and Canada starting next month via GKIDS. However, the first English language company to announce that they had acquired the film was, in fact, Australian distributor Madman Entertainment. Aussie fans are due to get a slight head-start on their US counterparts, as Madman have announced the film is to have a limited two-week cinema engagement starting May 14th. The film will be showing both in its original language and in the English language dub. To mark the occasion Madman have released a brief subtitled teaser- giving an English speaking fans their first official look at Hiromasa Yonebayashi's second film. When Marnie Was There adapts the English novel by Joan Robinson, transporting it to the Japanese Island of Hokkaido. It follows the friendship between a young girl name Anna and the eponymous Marnie, a mysterious girl who may not be what she appears to be. When Marnie Was There is due to open in New York and LA on May 22nd, opening wider the following week. No UK release has been announced at this time.